Bob Kolvoord, the first Esri education ambassador, spent a week at the SOS-Hermann Gmeiner International College (SOS-HGIC) in Tema, Ghana. 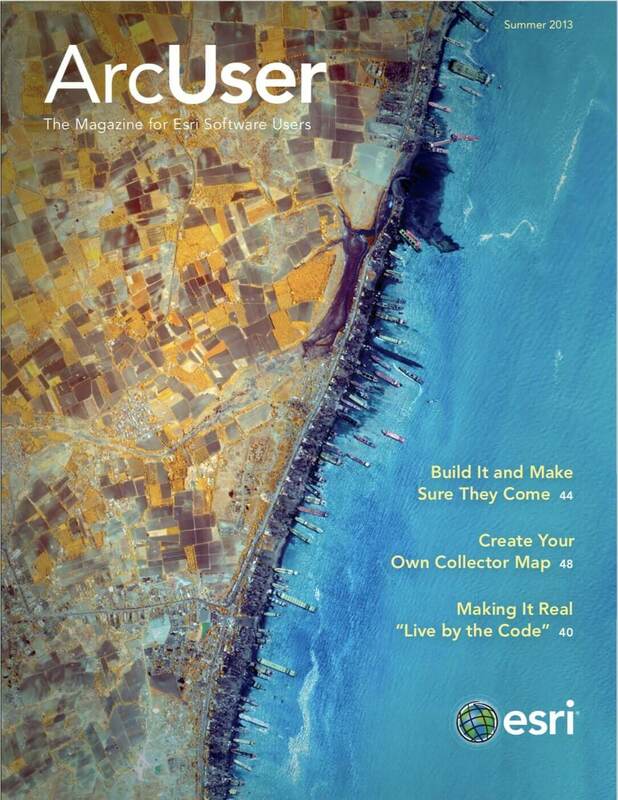 I was named Esri’s first education ambassador in 2012. Michael Gould, global education manager at Esri, had approached me earlier in the year about a pilot program the company was creating to introduce GIS to secondary students living in developing countries. In October 2012, I traveled to the Republic of Ghana to teach for a week at SOS-Hermann Gmeiner International College (SOS-HGIC) in Tema. The college is a project of SOS Kinderdorf International, which helps prepare students with promise from SOS Children’s Villages in Africa to enter educational institutions of higher learning. Kinderdorf is the world’s largest charity organization dedicated to sheltering orphaned and abandoned children. Prominent supporters include Nelson Mandela and the Dalai Lama. Stephen Bempah Owusu, a teacher in the Information and Communication Technology (ICT) department at SOS-HGIC, and James Annan-Aggrey of SAMBUS Company Ltd. had teamed together earlier in 2012 to introduce GIS concepts to the students at the college so that they would have some familiarity with the technology before I arrived. 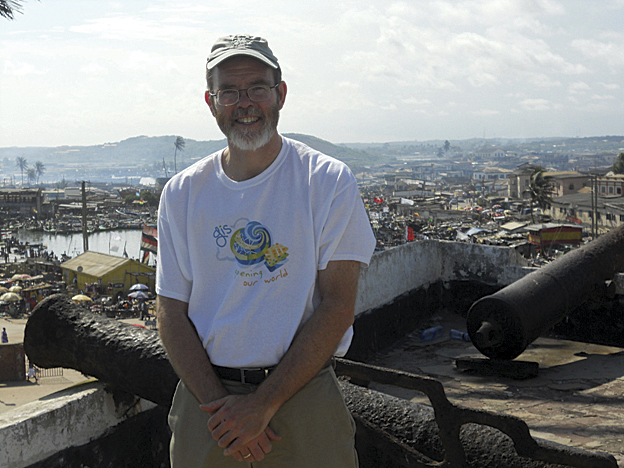 SAMBUS is a longtime Esri distributor and a supporter of GIS initiatives in Ghana. While GIS has been used for some time across the African continent, there have been few inroads in teaching it to primary and secondary students. With support from Esri, SOS-HGIC, and SAMBUS, we wanted to reverse this trend. As an advocate of using GIS in K–12 education in the United States, I was excited to have the opportunity to work with students abroad. My overall goal was to help them build their skills in GIS and—more importantly—spatial thinking and analysis. “The great thing about GIS is that it provides a good and practical example for showing convergent technologies and concepts in ICT,” Owusu said. GIS fits into the existing curriculum for students working toward the International General Certificate of Secondary Education and International Baccalaureate, which includes networks, GPS, databases, modeling, and simulation. I taught a GIS class consisting of 21 students and 10 staff members from SOS-HGIC and six teachers from three local high schools. The teachers plan to use GIS to give students the opportunity to explore the technology’s many uses. I began the week by introducing the class to ArcGIS. Some of the students and teachers had received the earlier GIS training, but for many in the room, this was their first taste of geospatial technology. One challenge I have found in working across cultures is locating the data and examples that best connect with my audience. World demographics were a big hit with the young people and adults, especially when we focused on African countries. One of the interesting things about SOS-HGIC is that students come from a variety of countries within Africa. Our group included students from Burkina Faso, Lesotho, Malawi, and South Africa. This diversity enlivened discussions, especially whenever the group compared Ghana’s economy and health demographics with those of its African neighbors. As the students identified patterns and looked for possible explanations, basic spatial thinking skills were being reinforced. Kolvoord taught a diverse class: 21 students from Burkina Faso, Lesotho, Malawi, and South Africa; 10 SOS-HGIC staff members; and six teachers from three local high schools. While the students worked through the basics of vector and raster GIS functions, including map layouts, queries, and symbology, they also learned about GPS. Along with global data, we were fortunate to have local data from SAMBUS. The students could work at a variety of scales and create maps of the areas where they live. As to the future of using GIS in teaching, Owusu said it will now happen regularly at SOS-Hermann Gmeiner International College. 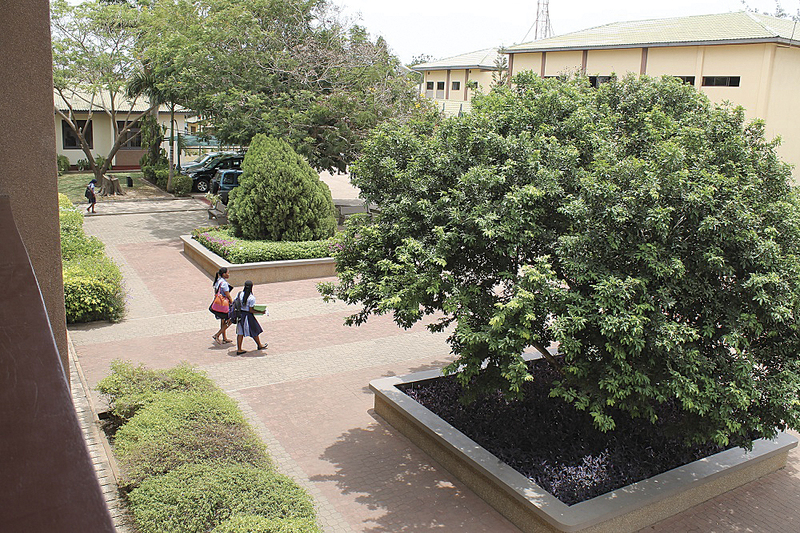 Students stroll across the SOS-Hermann Gmeiner International College in Tema. Interested in Being an Esri Education Ambassador? 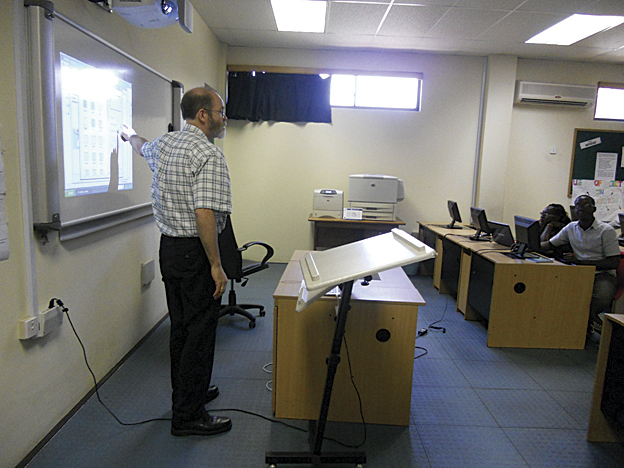 Many schools and universities in developing nations lack qualified GIS teachers. A brief educational visit from an experienced GIS instructor can provide just the kick-start these schools need. In response to the many requests Esri receives to support underprivileged schools, the company recently set aside a modest budget to help fund such education ambassador visits. Requests from schools will be prioritized and based on the available budget. Visits will typically last five to ten working days and focus on giving the students hands-on training in Esri technology so they can start to solve community and global problems. Are you interested in becoming an education ambassador? Send a summarized biographical sketch and a statement of your specific teaching expertise to edambassadors@esri.com. Bob Kolvoord is the Interim Dean at the College of Integrated Science and Engineering, James Madison University.